It’s not just the former inhabitants of Hill House who feel its sinister sway. The closer The Haunting Of Hill House takes us to Hill House, the more compelling the show becomes. The fragments of what happened that last night in the looming old house are coming together, and as “The Bent-Neck Lady” plays out, Nell edges closer to crossing its threshold one last time. Hill House is finally edging into the trick that so many of the best ghost stories play: It’s showing the dreadful appeal of a force that can tap into not just what scares you, but what you most dearly want. And at last, Hill House plays the cruelest trick up its sleeve. Unlike what we’ve seen of Luke and Theo and Shirley’s hauntings, Nell’s haunting is deeply personal. It’s as personal as a haunting can get. Nell has been haunting herself for most of her life, since her first night in Hill House as a 6-year-old girl. In this fifth episode, cuts between past and present work more fluidly, with director Mike Flanagan’s usual match cuts (an apple bitten into, a door swinging open) switched out for voice-overs of Nell narrating from her present, speaking in as rational a tone as she can muster about these nightmarish moments. First she tells a sleep-study tech, who we know is her future husband Arthur (Jordane Christie),“I’m frozen. I can’t talk, or move my arms or legs.” (My fellow sufferers of sleep paralysis will recognize these symptoms.) Her voice is clear but distant, lost in memory, until Arthur asks if she ever sees anything during these episodes. “Like what?” asks Nell, for the first time sounding evasive. That’s not all the subtext here. Victoria Pedretti conveys the first glimmers of attraction with irrepressible glimpses of giddiness, and Christie’s more restrained twinkle only befits Arthur’s professional bearing. When Nell blurts out, delighted, “Are you… are you asking me if I want to get coffee?” in response to his intake question (“Do you drink coffee?” is a standard sleep-study question), he too fumbles, then concedes that, yes, he was planning to wait until the end of their meeting to ask her out, but since she’s brought it up… It’s a meet-cute for the ages. This sleep study doesn’t just collect data; it helps participants create “an escape plan,” words Nell clings to like a life preserver. Though the montage of their evolving romance has all the soft-focus sweetness of a modern fairy tale, there’s an undertone of complication: Arthur is more than a handsome, kind, smart man. He’s the first person who has made Nell feel heard, and the first to offer an escape from her nightmare. “It’s nice to be listened to,” Nell says, near tears, and that sentence—that life-long desire to be heard and believed—sums up the sentiment that shapes Nell’s life and her death. What a relief that, five episodes in, Hill House has connected its hauntings to its humans. As Elizabeth Reaser did in an earlier episode, Pedretti makes the most of speechless scenes. In an episode of sleep paralysis—or what they think is sleep paralysis—Nell communicates only by trembles, clenched gasps, and shaky glances, but it’s easy to see a difference between the first instance and the second, fatal episode. Their love story flickers by too fast, just fast enough to be heartbreaking even if it’s also a little clichéd. When Nell’s sleep paralysis returns, Arthur wakes, too, and talks her through her escape plan. “It won’t stop the process but it could get rid of the panic,” he tells her at their first meeting, and that’s true until the fatal day when more comes back to Nell than sleep disorders. Hanging over them in the dark of their bedroom, The Bent-Neck Lady sees Arthur, Arthur sees her, and that is the end of their life together. Again, Nell’s voice overlays the end of the sequence. “He was dead. He was dead, and she was back,” she tells Dr. Montague. Russ Tamblyn plays a more reliable therapist this time, but not much more reliable. His advice to “confront your past” is good, but then his suggested first step is not delving into her family and personal history—her mother’s suicide, her family rifts, her desire to blame all her problems on an old house—but revisiting the closed-up estate. Except for Luke’s sobriety, they’re tragically small things to yearn for, because something the small things are the big things. (Oddly, Hugh says nothing.) 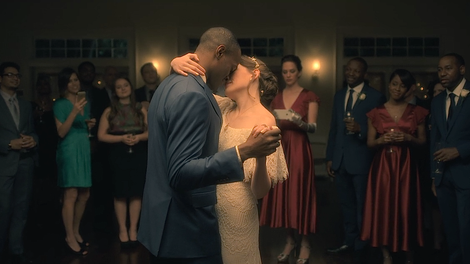 But then Luke steps aside, revealing Arthur in his wedding suit, and Nell dances off into bliss with him. It’s an illusion crafted by ghosts. Nell is dancing through the dismal dark of the house alone, guided by a force that wants her here—that knows she was always here. As young Nell ferociously warns Luke the night they flee Hill House, “That wasn’t Mommy.” In the guise of her mother, it tricks her into wrapping a rope around her throat, kisses her forehead, and pushes her to her death, and into something worse than death. Nell drops through the air and drops through time, revisiting herself in the suddenly dark nook of the motel, in the car with Luke, in her bedroom on the night Arthur died, in her childhood bedroom the first night she slept in Hill House. Fetched up horrifically at the end of her rope again and again, Nell has become The Bent Neck Lady. Nell has always been The Bent Neck Lady. Hill House has done its worst, and The Haunting Of Hill House has done its best. In Shirley Jackson’s novel, Dr. Montague hosts the meeting of strangers at Hill House, where he’s brought them to see if their supposed psychic abilities can reveal (or release) anything in the house, and Arthur is Mrs. Montague’s traveling companion, arriving on her coattails to join (or invade) her husband’s research retreat. When Hill House’s Nell takes Arthur’s name, she becomes Nell Vance, the birth name (or, as it would then have been called, maiden name) of Shirley Jackson’s protagonist. More nods to Shirley Jackson: the cup of stars (I had to cut a long rant about that); Mrs. Dudley’s speech about it, lifted from the first Nell Vance’s mouth and crammed all crooked into hers; the red writing on the wall blaring COME HOME NELL; the pyramid-shaped gate onto the estate. 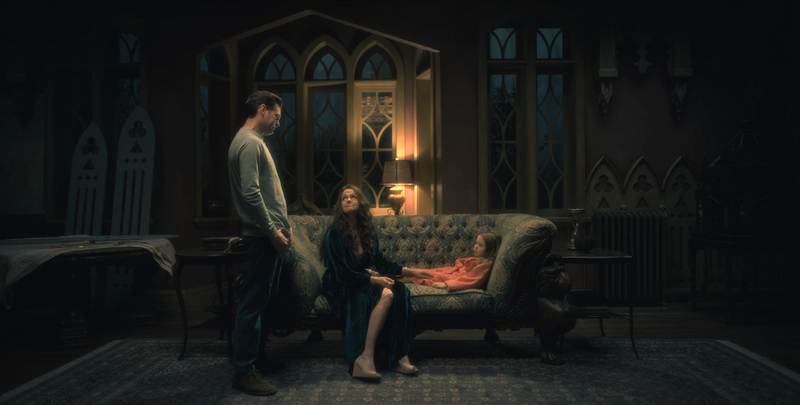 Don’t miss Katie Rife’s pre-air overview of The Haunting Of Hill House. With the advantage of reviewing the season as a whole, she finds it more successful than I initially did, and if future episodes are this solid, I will be swayed to agree with her.